Matthew Jensen’s multi-disciplinary practice combines photography with walking, collecting and rigorous site-specific explorations of landscapes. He strives to connect people to places by expanding the traditions of landscape photography to include a range of mediums and actions. Jensen received a B.A. in political science and fine arts from Rice University and a M.F.A in photography from the University of Connecticut. He is a 2016 Guggenheim Fellow, a 2016 grant recipient of the Peter S. Reed Foundation, and a MacDowell Fellow. His work is in the permanent collections of the Brooklyn Museum, the Metropolitan Museum of Art, and the National Gallery of Art, among others. Jensen is a part-time Assistant Professor of photography and studio art at Parsons/The New School where he has taught since 2012. He has also taught at SUNY Purchase, George Washington University and the University of Connecticut. Artist Matthew Jensen’s multi-disciplinary practice combines walking, collecting and rigorous site-specific explorations of landscapes. His projects strive to connect people to places by expanding the traditions of landscape photography to include a range of mediums and actions. Each body of work develops from time spent in publicly accessible landscapes or by examining the way different technologies transform this experience. Walking and participation have been central to a number of Jensen’s recent projects. Walking Flatbush, is an artist-map and poster created and distributed in conjunction with Crossing Brooklyn at the Brooklyn Museum (2014). A Walker’s Guide to Chadds Ford, also an artist-map and poster, was the centerpiece of Jensen’s solo exhibition at the Brandywine River Museum of Art in Chadds Ford, Pennsylvania (2014). Both maps combine found objects, native plants, historical research, and anecdotes with logistical information. Jensen combined community participation, walking, history, and collecting in his exhibition The Wilmington Center for the Study of Local Landscape at the Delaware Center for the Contemporary Arts (2013). The final installation provided an outlet for the work created by participants and also featured discoveries made by Jensen throughout the Wilmington park system. One series of photographs titled, Tree Love, documented the tree carvings and arborglyphs found in abundance along the Brandywine River. The age-old tradition was revealed to be a century-old subculture with thousands of carvings hiding off-trail on nearly every beech tree; a marriage proposal, poems, vulgarities, insults, countless hearts, and portraits dating as far back as 1903. Jensen designed and led artist walks in conjunction with the aforementioned exhibitions as well as for Storm King Art Center, the Municipal Arts Society, City as Living Laboratory, Lower Manhattan Cultural Council, Third Streaming and Elastic City. New York City landscapes have been the subject of many of Jensen’s photographic and collection-based projects. The ongoing project Park Artifacts has been presented in various iterations in solo exhibitions on Governors Island (2010), at Wave Hill (2012), at the Queens Museum during his ArtBuilt Mobile Studio residency (2015), and in Brooklyn Bridge Park (2016). The collection contains over 6,000 artifacts found in plain sight during walks through parks. Historical objects like a Spanish Real from 1746, flint arrowheads, clay pipes, and trading beads mix together with objects as familiar as fishing lures and plastic toys. Ian Frazier, writing for the New Yorker, described the wandering process in an article titled Lost and Found (23 July 2012). Light and landscape combine as metaphor in numerous works by Jensen. In 2009 the Metropolitan Museum of Art acquired his photographic series The 49 States and exhibited it in After Photoshop: Manipulated Photography in the Digital Age (2012). The photographs were derived from months of exploring small towns in the early days of Google Streetview. The series is also in the collection of the National Gallery of Art where it was also exhibited (2016). 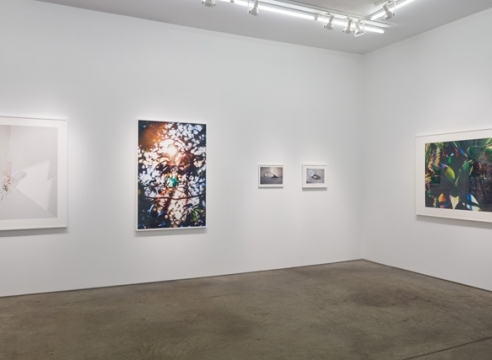 Other works like The Sun Returning, 14 Hour Sunset and Rainbow Around the Sun were exhibited together at Yancey Richardson Gallery as part of Jensen’s solo show Feels Like Real (2015). Matthew Jensen received his B.A. in political science and fine arts from Rice University in 2002. He worked on a number of national, state, and city grassroots political campaigns prior to receiving his M.F.A from the University of Connecticut in photography and sculpture in 2008. He is a MacDowell Fellow and has participated in residencies at the Queens Museum, Lower Manhattan Cultural Council, Wave Hill and Kimmel Harding Nelson Center for the Arts. Jensen has been a part-time lecturer of photography and studio art at Parsons/The New School since 2012. He has also taught at SUNY Purchase, George Washington University and the University of Connecticut.